A lavish and luxurious 34 carat la dolce vita style diamond and gold brooch from Bulgari. This piece is anything but simple, boasting 34 carats of the finest round brilliant cut diamonds set in 18k yellow gold. 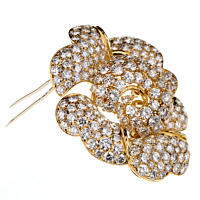 This gorgeous brooch may also be worn as a pendant necklace. 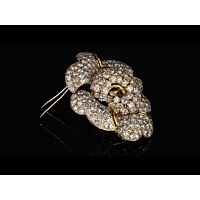 This stunning brooch is a once-in-a-lifetime piece for any collection and is sure to wow wherever it's worn.